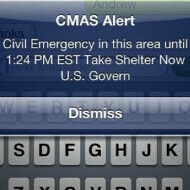 FEMA and the FCC are currently testing the Commercial Mobile Alert System (CMAS), which is a joint effort for a nationwide emergency alert system, involving the mobile carriers. The goal is to inform people when a disaster strikes, anywhere there is cell phone coverage, but the duo sent a pretty formidable message to some of Verizon's subscribers in the New Jersey area: "Civil Emergency in this area until 1:24 PM EST Take Shelter Now U.S. Govern". Verizon's take on the matter is that the text message was part of the CMAS testing scheme, but was outed without proper labeling, although it wasn't quite sure what happened and will be looking into the matter further. The alert system will allow for portable mobile towers to be raised in disaster-stricken areas, restoring cell phone service and texting instructions to the citizenry affected. They should send an alert telling us to hide from congress. They tend to be the disaster these days. They should be getting sued for this. This is very irresponsible. They should be sued for trying to create a system to help people in emergency situations? Your an idiot. It's a new system, their will be hiccups, deal with it. Your probably the same person who would sue if we DIDN'T have a system to save your sorry @$$!!! Last I checked, FEMA is a federal agency... irresponsible or not, they can't be sued. I'll get right on that. Soon as I'm done suing Verizon for holding back the Nexus release. Yeah, you're absolutely right. They should be sued for not saying "This is only a test." Get over it. This is seriously what is wrong with the United States these days. Everyone needs to sue everyone else. If you sue these people over something so menial as this then you will be, in my books, the same as that person who sued McDonald's for giving a hot coffee to her son and he burnt his mouth. And so now they have to have that label on it that says: Caution May Be Hot! We need to stop suing people for the stupidest things. And in this case, if you did sue them, all you would get is taxpayer money. So you would be taking money from your neighbors, not the government itself. Great plan genius. that's weird I got one that said "ZOMBIE APOCALYPSE IN AFFECT"